This casually upscale, vacation-styled condominium awaits you in the relaxed community of Bonita Village! It is close to everything so you can have your feet in the warm sands of Bonita Beach in as little as 180 seconds, or be shopping at Coconut Point Mall, South Florida's largest new mall, in 10 minutes. Upon your arrival the huge, beach entry Resort Pool and Waterfall will be all yours. Our own private Island is in the middle of our magnificent Resort Pool. And, you'll love the fabulous Poolside Chickee, dubbed The Groggy Frog! It has 2 TV's and in season and most weekends serves casual fare and beverages. Also, for your enjoyment are two large Spas, and the exciting Island Clubhouse with a marvelous Cybex Gym, Billiards Room, plus Game, Media and Social Rooms. This new, professionally decorated 2 bedroom offers a tropical flair to complement the community's atmosphere. The main living areas and lanai feature porcelain tile floors. The kitchen has granite kitchen counters and you will feel right at home with the crown molded volume ceilings. You will enjoy the convenience of the outside staircase to your personal patio which is only steps from the pool! 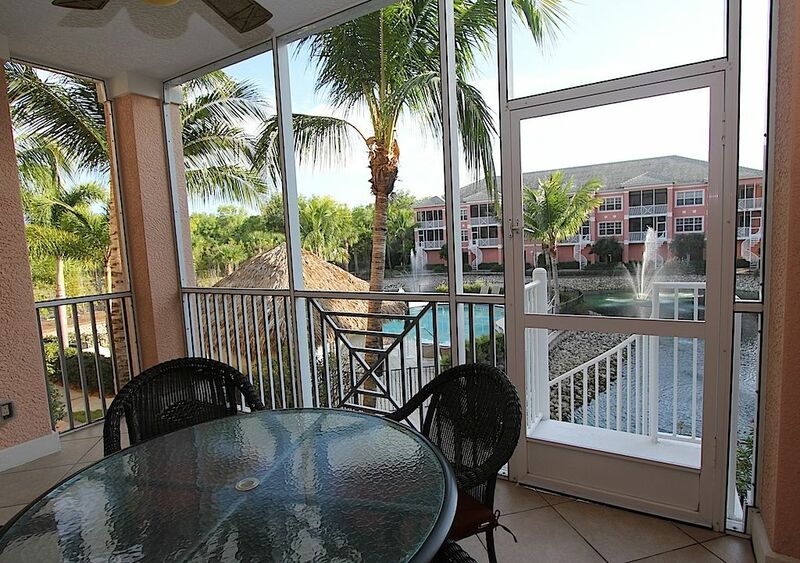 This is one of the nicest vacation condos you will find in the area. The master bath hosts a spacious walk-in shower and dual vanities! The living area is light and bright and features a 50" Flat Screen with DVD. Matching Flat Screen TV's with built-in DVD?s serve the master and guest bedrooms. A King bed is featured in the Master Suite with the option of King or Twin beds in the Guest Suite. High-speed wireless Wi-Fi Internet is offered in the Island House. There is something for everyone at Bonita Village; whether it's making friends around the sunny Resort Pool and Chickee, riding the Free Private Beach Shuttle to shell-laden Bonita Beach! The view is of the Water Garden and fountains around the "Quiet Pool" and is the perfect place to immerse yourself in that new novel. For a delightful evening out sample one of the 20 plus specialty restaurants close by. If you enjoy the arts you may prefer an evening at the Philharmonic, or step it up a notch by visiting bustling Fifth Avenue in downtown Naples. All the outdoor sports and activities listed are only a stone's throw away. Quick and convenient access to this fabulous destination is available from the Regional Southwest Airport (RSW) which is only 25 minutes away. Preferred weeks and months went fast last year. Book your stay now and prepare to "Experience the Fun of It" in the amenity rich resort-style condominium of Bonita Village! We can safely say you will not be disappointed! Free Beach Shuttle everyday! Also enjoy 'The Groggy Frog', our Poolside Chickee with food an beverage service and 2 TV's. The Island House has a 5 foot TV in the Media Room, billiards Room, Game Room, Social Room with kitchen. I traveled to Bonita Springs with my wife and two teenage daughters. We found our condo at Bonita Village to be very clean and spacious. We really liked the décor and the amenities the village provided. Our condo was off the smaller of the two pools at the complex, but we liked cause it was quieter on that side. It was an easy walk to get to the big pool and other amenities. The staff at Bonita Village were great and helped us with anything we needed. We would definitely book another stay. Thank you for the great review! So glad you enjoyed your stay with us at Bonita Village. Hope to see you in the future! Our office is located in the Island House. Our address is 27901 Bonita Village Blvd. Bonita Springs, FL 34134. For information on other activities you are interested in call our office at 239 390 8860. Refundable Security Deposit: $250 week/$500 month. State and County Tax 11%.